Custom menus, fresh ingredients and prices that match your budget. Below is a sample of popular ChefauChef options, which are only the beginning of what ChefauChef can prepare. From family recipes to the food pics you saw on The Knot or Pinterest, Chef Aaron and his team will work with you to create a custom menu for your event. Please note: ChefauChef does not do tastings. 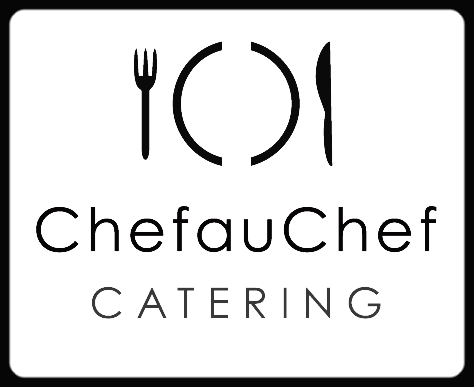 1) ChefauChef does not stock all items on hand at any given time because they make each menu to order the day of the event. This allows ChefauChef to keep their inventory low, which in return helps keeps costs low. 2) To cook for 2-4 people is nothing like cooking for 200+ people, the timing and end products are going to be different, it is not a fair representation of the products. A 25% non refundable deposit is required to lock in any wedding caterings. Any order over $400 requires a 25%, non refundable, deposit to lock in the order. Final head counts for wedding are due two weeks before the event date, final payment is as follows: Checks- two weeks out. Credit card and cash payment are due the day before the event. Please note that ChefauChef does not automatically add in gratuity to our invoices, we allow you to determine what our tip should be if you desire to bless us with one. All prices below are for finished products presented in disposable pans, unless other wise arranged. If you desire nicer platters, chaffers, and/or a ChefauChef staff for the event, a 20% service charge will be added to the final bill. Any meal that is plated it subject to a 30% service charge added to the final bill. Wedding Buffet Service fee 20% and includes ChefauChef to deliver and set up the buffet, we provide eco-friendly disposable plates, napkins, silverware. We also provide chaffing dishes, and serving utensils. ChefauChef staff helps clear dinner plates from the guest table before they leave. Leftovers are yours to enjoy and keep. If the facility has a fridge on site, we will leave the left over there. If not, you can pick up at ChefauChef's kitchen on our next Business day. If you do not want your left over we will donate them to local non profits around town to help feed our community. If you desire to rent real china, there will be a $2+taxes/guest added to the final bill to help cover the extra labor required to clear and re-box the rented dinnerware. This charge is not for the rental of the china. If you would like us to handle the rental and handling of the china, $7/person plus sales tax. Orders over $75 get free deliver, other wise a $10 Lincoln delivery charge will be added to bill. ChefauChef is willing to deliver outside of Lincoln for an "out side Lincoln Fee" to be determined by location and date. Events over 300 people, Churches, Schools, and non profits get a discount at ChefauChef owner's discretion. Minimum order of 10 people per item, unless otherwise noted. All items are priced per person, unless noted other wise. Price DOES NOT include tax or service charge. Can serve buffet style, boxed individually, or plated. A ChefauChef original dip. Scratch made pesto fused into a melted cheese fondue. Served with Chips and Sliced Bread or Fresh Vegetables. Classic style deviled eggs, but with CaC (ChefauChef) twist. Eggs whites filled with yolks, mayo, dill, paprika, & garlic salt. Midwest style bruschetta. Tomatoes, grilled sweet corn, fresh mozzarella Cheese and basil. Finished with a white balsamic reduction. Creamy dip served with your choice of fresh fried tortilla chips or sliced French bread. Fresh Jalapeno sliced in half and filled with a creamy Thai curry cheese mixture. House-made meatballs in a creamy bleu cheese sauce. House-made meatballs in a rosemary demi glace sauce. Delicious shrimp served on leafy lettuce accompanied with a vodka cocktail sauce. Salmon mousse piped into a puff pastry. Thin sliced seasoned beef Philly, mushrooms, peppers, and onions with melted cheese on a Hoagie Bun. Roasted chicken seasoned with curry, grapes, garlic, carrots, and mayonnaise. Sliced turkey with adobo mayo (spicy smoky flavor) cheese, and lettuce. Sliced Ham with pepper mayo and cheese. Spinach, peppers, cucumbers, carrots, tomatoes, light onions, gucammus, and balsamic drizzle. sliced roast beef with Cajun mayo, lettuce, and bleu cheese crumbles. Romaine lettuce paired with parmesan cheese, herb croutons, thin sliced red onions, and tossed in a Caesar dressing. Shredded Iceberg & Spinach lettuce. With crispy wontons and a fresh ginger vinaigrette. Fresh Spinach with tomatoes, red onions, sunflower seeds, dressed with CaC’s Caper Vinaigrette. Potatoes, whole grain mustard, mayonnaise, and dill pickles. Fresh shredded red & green cabbage, shredded carrots, and a spicy cajun dressing. Corn fed flank steak, tenderized & stuffed with artichokes, red peppers and mozzarella cheese. Thin sliced radishes pickled with fresh tarragon. CaC’s way of mashed potatoes. Fresh Idaho potatoes slammed together with sour cream CaC’s blend of seasonings. Elbow pasta cooked al dente and sauced with our house made cheese sauce. Simple but delicious! Beautiful roasted Red Potatoes seasoned the Montreal way. A. Steam white rice enhanced with fresh chiffonade spinach. Freshly sliced Idaho Potatoes combined with a Feta, Gouda, and Munster au gratin sauce. Fresh Squash and Zucchini sautéed in Lemon Garlic oil. crispy green beans with bleu cheese. add bacon for 50 cents. taco meat, two taco shells, Spanish rice, refried beans, cheese, lettuce, salsa. ground season beef, nacho cheese sauce, chips, black olives, jalapenos, salsa, and sour cream. macaroni pasta, Alfredo sauce, cheese sauce, shredded chicken, bacon pieces, jalapenos, shredded cheese, crushed Doritos, sliced green onions, and black olives. Ham or Turkey and cheese sandwich, bag of chips, and cookie. Potatoes, cheese sauce, chili, bacon, steamed broccoli, sour cream, shredded cheese, and butter. Gyro meat and sliced chicken, pita bread, Greek potatoes, shredded lettuce, diced onions, feta cheese, and fresh made tzatziki sauce. Two pastas, Meat Marinara, Chicken Alfredo, Garlic Bread, Salad, and Cookie. 13” flour tortilla filled with eggs, bacon, sausage, hashbrowns, and cheese. Side of salsa. Platter includes: 5 rolls filled with three different veggies, sushi rice, and CaC’s ginger spread. Same as Platter above but with one choice of Sashimi. Platter includes: 10 rolls filled with three different veggies, sushi rice, and CaC’s ginger spread. Same as Platter above but up to two types Sashimi. Platter includes: 20 rolls filled with three different veggies, sushi rice, and CaC’s ginger spread. Same as Platter above but with up to three different types of Sashimi. This Platter included combination of vegetable, sashimi, and Nigiri Sushi. Also, get a variety of different wrapping methods.